Casa Mimma es un apartamento moderno y elegante en el segundo piso de un edificio histórico, acogedor y confortable, funcional y una gran atención al detalle, con techos altos. Tiene capacidad para 4 personas. El ascensor sube a la primera planta. 85 m², cocina independiente, gran salón-comedor y una zona de comedor, 2 dormitorios, 2 baños, amueblado con cuidado. Hasta 4 personas, no es adecuado para los niños porque el 'mobiliario es delicada. En la cocina, a su llegada, se encuentra el 'esencial para su desayuno a la mañana siguiente sin tener que preocuparse acerca de las compras. Apartamento L 'tiene ropa de alta calidad, calefacción, aire acondicionado y wifi gratuito. E 'equipado con suelos de madera en todas las habitaciones, excepto en los 2 cuartos de baño y la cocina. Francesca, el propietario, vive en el mismo edificio, en el apartamento de al lado, a continuación, le dará la bienvenida y se hará cargo de sus necesidades durante su estancia. L 'apartamento ha sido recientemente renovado, en el centro histórico de Pavía, cerca del Duomo, la' Universidad, Plaza de la Victoria, en la zona peatonal, cerca de supermercados, restaurantes y cafés. 3. Apartamento L 'se encuentra en un edificio elegante, a continuación, pide tener un comportamiento respetuoso evitando ruidos en particular entre 22. 00 y 08. 00 am. Ningún partido !! Llegada normalmente de 16. 00 a 19. 00, admitió en todo caso hasta el 21. 00, sin costo adicional. A su llegada se le pedirá que haga una fotocopia de su DNI o pasaporte. Sólo las personas nombradas en la reserva y luego registrados pueden dormir en el apartamento. Ambos baños tienen espejos de pared completa. L'appartement est encore plus beau que sur les photos et il est au coeur même de la ville historique. Nous avons passé 3 jours dans cet appartement aménagé avec goût, confortable et très propre. Nous avons pu profiter des belles places qui sont à 2 pas (bars, bons restaurants sympas et supermarché) et visiter Pavie à pieds. Même le trajet gare-appartement se fait à pieds en 10 minutes. De plus Francesca nous a réservé un très bon accueil : elle a été très prévenante et nous a donné de bons conseils. Nous avions même de quoi faire nos petit-déjeuners et même un petit repas. Nous reviendrons avec un grand plaisir. Brigitte e la sua famiglia hanno soggiornato nel mio appartamento per qualche giorno in agosto. La comunicazione è stata molto semplice fin dall'inizio fino alla loro partenza. Sono stati ospiti graditissimi, hanno rispettato senza problemi le regole della casa e l'hanno lasciata in perfetto ordine! Spero di poterli accogliere presto ancora! We stayed in Francesca’s own apartment in the same location. We were visiting Pavia on a family holiday. It is a very comfortable and attractive apartment. It includes all conveniences and was very clean. It’s central location does mean that there is street noise at night. We knew from Francesca when we booked and it was not a problem for our stay. It is much quieter in the bedrooms which are a floor above the sitting room and at the top of the building. Francesca was a very helpful, reliable and responsive host. She was excellent. Pavia was a lovely place to visit and base ourselves for a week. The apartment is an easy 10-15minute walk to the train station. The main square and Duomo square are only a couple of minutes either direction from the apartment. We really enjoyed our stay in Pavia in Francesca’s property. Thank you Francesca. Das Appartement entspricht ganz der Beschreibung, sehr zentral gelegen, schön eingerichtet und mit weit mehr als nur dem Notwendigen versehen (sogar mit Ohrstöpseln gegen den nächtlichen Lärm, der mit der zentralen Lage verbunden ist). Bei der Ankunft waren schon die Zutaten für das nächste Frühstück im Kühlschrank, wir fühlten uns wirklich willkommen. Vielen Dank für die schönen Tage. We had stayed in this apartment for ten days in early September 2017. The apartment was tastefully and comfortably furnished (including air conditioning) and was immaculately clean when we had arrived. Francesca was a very welcoming and an attentive owner who made sure we were comfortable and our stay there was as pleasant as possible. The apartment is very centrally located and ideal for shopping, local dining and sightseeing. It can get a little noisy at night from the local bars but no more than can be expected in any other central Italian city location. In conclusion, our overall experience was an exceptionally positive one and we highly recommend. We stayed in Casa Mimma for 3 nights and thoroughly enjoyed our stay. Francesca was responsive via emails prior to our stay and both her and her son who greeted us at the apartment on arrival were extremely helpful and friendly. Both speak excellent English. We appreciated her very thoughtful gesture of including a small amount of basic items such as milk, spreads, fruit and yoghurt. We needed to visit a smaller outlying village during our stay and Francesca helped us with arranging taxis. The apartment itself is well appointed and beautifully furnished. We only used the kitchen for breakfast and the occasional lunch, however it appeared to have what is required to make a meal. The beds and sofas were comfortable. The whole apartment was spotlessly clean. 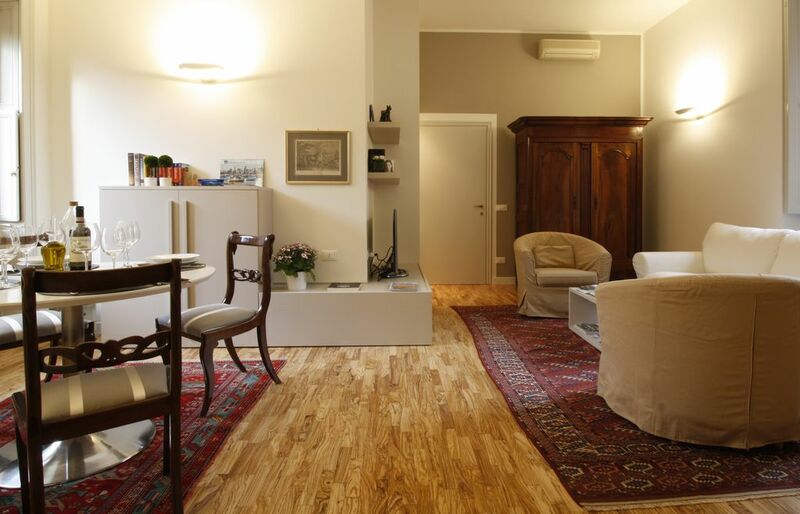 It is extrememly conveniently located just around the corner from the Duomo and the main piazza della Vittoria. All the sights were within easy walking distance. The apartment is a flat 800-900m from the train station and is an easy walk (straight pretty much all the way until the last turn at the end). I wouldn't hesitate to stay here again. Thank you Francesca for helping us make our visit here so enjoyable! Casa Mimma está situado en el segundo piso de uno de los edificios históricos más prestigiosos de la ciudad (XV sec. ), Justo entre la Piazza del Duomo (donde se encuentra la Catedral) y la Plaza de la Victoria, famosa por sus numerosos cafés a 'abierta. En la zona central se encuentran, además de la 'Universidad, las más famosas iglesias de Pavia. La parada de ómnibus se encuentra a pocos pasos de la entrada del edificio. The price shown is intended for 2 persons. Every extra person up to max 4 will be charged plus € 30 per night (per person). Il prezzo indicato è inteso per 2 persone. Per ogni persona in più fino a max 4 verranno richiesti + € 30,00 For final cleanings you will be asked euro 30 at your departure. Damage deposit euro 250 to be paid at your arrival. The amount will be given back to you barring any property damage.